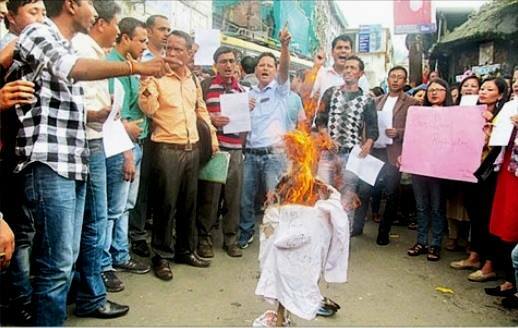 Bringing relief to the voluntary teachers in the hills amid the upheaval brought about by the Centre's demonitisation decision, the state government has finally decided to absorb 390 of them in the first phase after conducting special interviews, to be conducted by the Gorkhaland Territorial Administration. Speaking to reporters today in Darjeeling, Gorkha Janmukti Morcha general secretary and GTA education department in-charge Roshan Giri said he was informed about the decision by state education minister Partha Chatterjee over the phone from Kolkata. Rohit Sharma, the MLA from Kurseong, on Wednesday reportedly met Chatterjee at the legislative assembly and discussed the issue of regularising the 515 voluntary teachers of the hills. “Our MLA met Chatterjee in Kolkata to discuss the regularisation issue, and the minister asked him to submit the list of vacant posts and voluntary teachers in the high and higher secondary schools of the hills. Chatterjee told Sharma to update me about the discussion between the two of them,” Giri said. The GTA sabhasad said he called up the education minister this morning and was told that out of the 515 voluntary teachers presently working, 390 would be regularised in the first phase. “The minister said the list of vacant posts are to be submitted to the DI of schools of the hills, and this has already been done by the schools. Chatterjee also told me that interviews to absorb these teachers would be conducted by the GTA in January 2017,” said Giri. The 515 voluntary teachers have been serving in 129 junior, high and higher secondary schools since the past 10-15 years. They were compelled to agitate earlier this year to get the required attention from the state government and the GTA to their demand for regularisation. After several rounds of meetings, the state education minister assured to absorb the voluntary teachers by exempting them from the School Service Commission system. But their joy was shortlived as the joint secretary of the state school education department issued a letter in May asserting that regularisation, absorption and appointment of voluntary teachers in the GTA could not be entertained until they secured their candidature through the WBSSC. “Due to the absence of the SSC in the hills since 2003, it is difficult to appoint teachers. In fact, the managing committees of the schools engaged these teachers on voluntary basis. But now their numbers have swelled to nearly 600. It must also be remembered that the schools have been upgraded and new subjects introduced over the years, which compelled the schools to seek the services of the voluntary teacher," said Giri. On the recruitment process, he said it would have to be done by the GTA as education is a transferred subject. “Since education is a transferred subject, the GTA will conduct the interviews in the hills. We will start the process in January after we receive the guidelines from the state school education department,” said Giri.